Filep Motwary was born in Cyprus. He is the Editor at Large of Vogue Greece. “Theorem[a]: The Body, Emotion + Politics in Fashion”, is his second book and it was released in January 2019. Published by SKIRA the publication came as a collaboration of Motwary with Polimoda college and University in Florence. He the curator of Haute-à-Porter, a personal curatorial concept that was presented as an exhibition at the Modemuseum of Hasselt in Belgium from April until September in 2016, and was ranked by French Vogue as one of the TOP3 for the year 2016, internationally. Since 2010, he is the Fashion Features Editor of Dapper Dan Magazine. Since 2010 Motwary writes or photographs stories for magazines and online platforms such as METAL magazine, Vogue.fr, Vogue.it, New Yorker’s THE CUT, Boycott Magazine, Harper’s Bazaar, W magazine, Mixte Magazine, Totem, Kenzo, Chloe, Mercedes Benz, TheStimuleye among others. Between 2011-2015 he collaborated closely with the founder and director of the Villa Noailles and Hyères Festival, Jean-Pierre Blanc. Motwary’s first job was to assist a stylist for the Greek editions of L’Officiel and Vogue in early 2000 followed by four years as the head studio designer for the Athenian couturier Loukia for both her Haute Couture and prêt-a-porter before moving to Paris consisting lengthy internships for designers like John Galliano, Christian Dior and Chloe from 2003 to 2005. Today, Motwary continues to create costumes for bespoke projects, as well as in collaboration with jewelry designer Maria Mastori with whom he worked together on six prêt-a-porter collections, from 2006 to 2011. In 2012 he was invited by Linda Loppa to conduct a series of video and written interviews focusing on the subjects Fetish, Monsters and Bridges. Among others Motwary interviewed Rick Owens, Tim Blanks, Bruce Pask, Christian Lacroix, Robin Schulie, Etienne Russo, Humberto Leon (Kenzo), Marlo Saalmink […]. From 2005 to 2015, he was the founder of the twice awarded blog, the renowned Un nouVeau iDEAL that was listed among others in William Oliver and Susie Bubble book “The World’s Top Fashion Blogs” published by PRESTEL (2011). Premiere Vision and Zoom by Fatex invited Motwary to exhibit a series of large-scale photographs as a solo show, titled “STREET IT BOYZ” in February 2014. Motwary has curated the educational event FASHION ON SCREEN, a short-films festival presented in Athens organized by Fashion Workshop in 2014 and 2015 respectively. On June 28th 2016, 2016 he curated “Haute-ART-Porter” a mini-exhibition affiliated to Haute-à-Porter, at the Modemuseum of Hasselt in Belgium. “Haute-ART-Porter” was the outcome from three workshops that took place between the dates 10 to 21 May, 2016 in Hasselt and involved students from three local ART universities: Stedelijke Academie voor Schone Kunsten Hasselt, Provinciale Kunsthumaniora Hasselt and PXL-MAD | School of Arts. The workshops focused on three subjects on which the students produced fashion illustrations based on garments presented in the Haute-à-Porter exhibition, Japanese designer Yohji Yamamoto and British-Gibraltar born designer John Galliano. On July 2nd 2016, Motwary was invited as a guest of FASHIONCLASH in Maastricht to speak both about the exhibition and his book under the title Haute-à-Porter. For Modemuseum Hasselt’s following exhibition titled ACROSS JAPAN, Motwary did the selection of participant garments and artwork, the preparation and research along with the visuals presented within. The exhibition opened on 4 March 2017. In April 2017 along with Dobrila Denegri, Yannick Aellen and Franc´Pairon, Filep Motwary was invited as a jury member for the last edition of the Austrian Fashion Awards and Take Festival. The Cyprus Ministry of Education and Culture has invited Motwary to present his career highlights formed as a lecture to the students of the “First Technical Lyceum” in Nicosia, on On October 24, 2017. On November 20 and 21st, 2017 he was invited to direct a two-day workshop at the 1st Technical Lyceum of Nicosia (CY) as part of “ACT” (ΔΡΑΣΕ) a project supported by the EU. It featured students between the ages 14-17. The workshop focused on the differences or similarities between Haute Couture and prêt-à-porter in contemporary fashion. On April 18, 2018, Motwary visited Florence by invitation of Polimoda’s Director Danilo Venturi for a lecture, presented through “Rendez Vous” the well known series presented at Villa Favard. His lecture was titled “Fashion Out Of Fashion” and was presented in Villa Favard’s Aula Magna. From April 27th until June 2nd, 2018 he presented his second monographic photography exhibition at the Zampelas Art Museum in Nicosia, Cyprus. From February to June 2018, Filep Motwary was a lecturer at Polimoda college and University in Florence teaching the art and history of “FASHION CURATION” to different sets of Masters students. LICHTING, the joint project of Amsterdam Fashion Week and HTNK Fashion Recruitment & Consultancy has invited him to be a member of its panel in September for it’s 2018 edition. PREMIERE VISION + ZOOM BY FATEX. Paris 2013 (Solo show photography at PREMIERE VISION Paris). LOUKIA OMNIUM GATHERUM. Athens 2016 (group show – photography). ZAMBELAS ART MUSEUM. Nicosia 2018 ( Solo show focusing on two of Motwary’s work aspects, photography and journalism). MODEMUSEUM HASSELT, ACROSS JAPAN, Hasselt March 2017 (research & selections of garments and visuals presented). The logo for this website is an artwork by renowned calligrapher Nicolas Ouchenir. 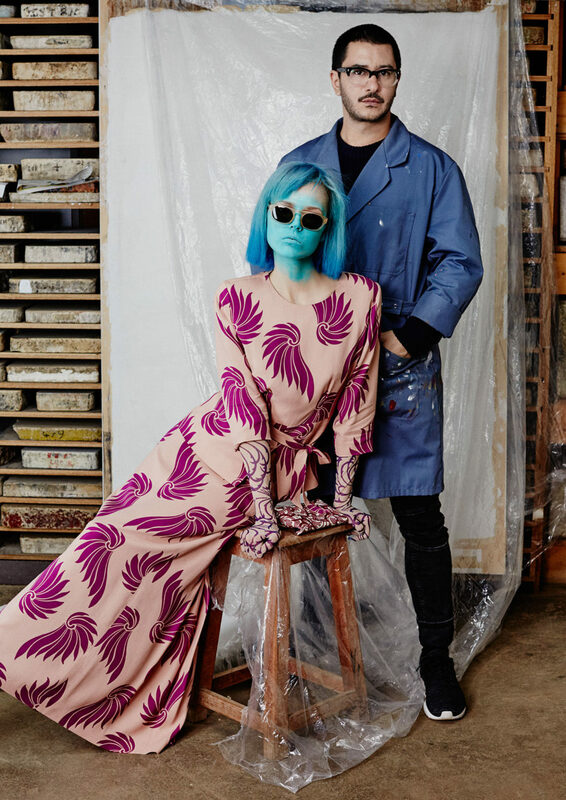 Portrait of Filep Motwary with Ola Rudnicka wearing Dries Van Noten ss16, photo Rene Habermacher.